Marissa Mayer, the long-time Google executive, has been named Yahoo president and CEO, the New York Times first reported. She resigned from Google Monday and starts at Yahoo Tuesday. Ross Levinsohn had been Yahoo’s interim CEO after the departure of Scott Thompson in May. The Yahoo board had been considering him for a more permanent position along with other candidates, including Hulu CEO Jason Kilar. The move is a big promotion for Mayer, who has not been part of the core leadership team at Larry Page’s Google despite her long tenure and previous influence at the company. 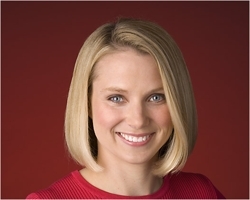 The Yahoo board, which Mayer will join, said its decision was unanimous. Mayer has an undergrad degree in symbolic systems and a masters in computer science (yes, a real one) from Stanford University. She is also on the board of Walmart, the San Francisco Museum of Modern Art, the San Francisco Ballet and the New York City Ballet. Shares of Yahoo, which reports its quarterly earnings tomorrow, were up two percent in after-hours trading. Thank you @marissamayer for helping build Google over the last 13 years, and good luck in your new adventures with Y!